Back to school gets every schedule suited up for a year of success! Routines are reinforced, lists grow longer and schedules are a must-have. 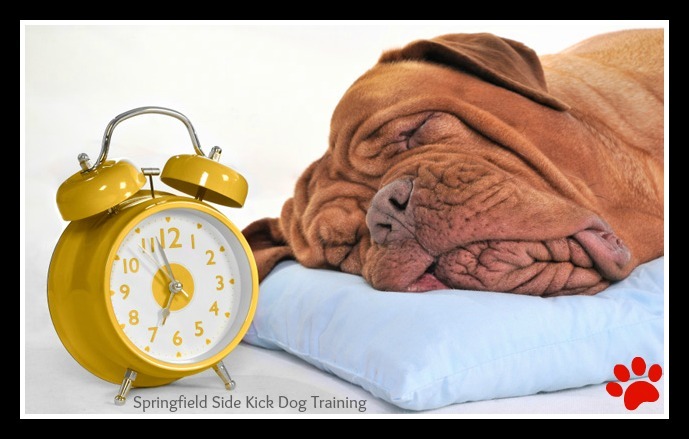 What does this mean for your dog's schedule? Do potty trips need to be by appointment-only? Are Summer play sessions a thing of the past? Adhering to a daily routine is largely the personal lifestyle choice of the owner. Rather than create a strict schedule with my own dogs, I opt for a more flexible one when it comes to food, exercise and training. Of course, a flexible lifestyle doesn't work for every human or pet - and some animals may be dependent upon medication or feeding schedules that are recommended by their veterinarians. Typically, owners who follow strict routines often have to plan their entire lives around their pets. Not only is this an impractical and unnecessary burden, but it also allows the dog to run the household. Instead, he needs to understand that he has to work toward receiving rewards throughout the day. Dogs who are on strict schedules will also wake up their owners sharply at 7 A.M. — despite the fact that it's the weekend, since canines have yet to tap into what it means to have a day off. This can turn the dog into an annoyance for an owner, as well as cause undue stress for a pet who's confused as to why the normal routine isn't in place. Heavily ingrained routines can also lead to separation anxiety. A dog will often read his owner's subtle cues, so if the owner is gone for a set amount of time each day, the dog will react with anxiety directly before his owner leaves, while he's gone and just before the dog expects his owner to return. In fact, one way to help a dog deal with separation anxiety is to mix up his routine, so he can't anticipate when an owner is about to leave or how long he'll be away. Although routines may not be advisable for most dogs, a pet should have some structure throughout the day to make sure that all of his needs are met daily. For starters, every dog should have a daily exercise routine. A dog should also be fed a certain pre-measured amount throughout the day, but the timing depends on a veterinarian’s recommendations. By mixing up rewards, such as small meals and variable walks throughout the day, you'll establish your leadership role and help your dog to understand that every moment of the day is the right time to pay attention and respond to his human companion. Overall, schedules are healthy measures for dogs and humans so that we can both prepare, expect and look forward to all that we have to do. Ultimately, learning to be flexible proves to be just as valuable in life so that we can be prepared to adapt when necessary.